It looks like I'll be getting some new wheeeeeeels. I'll have a light/short section wheelset (Soul 2.0s), so I'm looking for this to be a TT/crit/not a whole lot of climbing wheelset. So far, I've got my eyes on the Williams 38 carbons, Williams 58 carbons, and American Classic 58 carbons (are there any similar wheelsets on the market at around that price range?). I've also considered some aluminum 30mm rims, but if I can get carbon and a deeper section for the same price, I don't really see why not (unless there's a blatant durability issue). I'm leaning toward the Williams 38 carbons, mostly because I think 58mm will be too deep (gasp!). Basically, I want to know the difference between a 38mm and 58mm wheelset, pros/cons, and whatever you've got to tell me! Thanks. We'll it's obvious you're going to win more races with 58, no contest . I'm curious to see the answers too, I'm on the deep section bandwagon right now too, cept I'm looking at Reynolds DV46T and Easton EC90 Aeros. If you're going to get a deep rim, get a deep one. 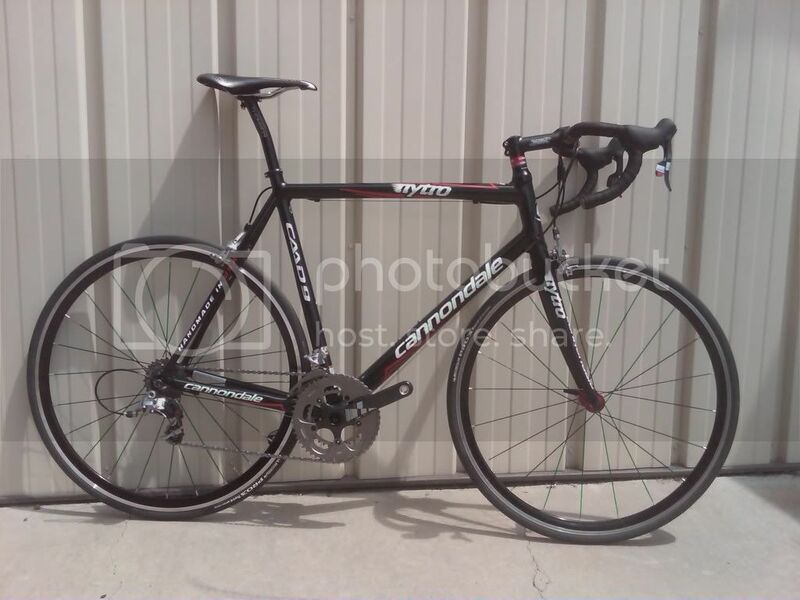 I'm looking for this to be a TT/crit/not a whole lot of climbing wheelset. I have DV46s (T and C) and would like to eventually replace them with much taller wheels, 58/66/69mm range. I'd also want to get a shallow front wheel, like 38 or less. I race on a heavier and more flexible 58mm front wheel when it's flat, or on Spec TriSpokes (Hed3). Is there a big durability issue with carbon rims vs. aluminum rims? I'm still a 5, and can't really afford to be buying a new wheelset often (the reason I'm buying a new wheelset is that my Soul 2.0 rims got knocked out of true pretty hard and need to be sent back to Sean from Soul). My carbon wheels are my only wheels that I have not had some kind of problem with them. I've even been hit by a car on them (broke my ribs) and the wheels are still good and true. I debated the sane thing between Zipp 303 (42mm) and 404 (58mm). The 42 definately are lighter and I can feel the difference on hills. The 58 is noticably faster but strong winds make you feel the difference in handling. I ended up with 303's after test riding them at the LBS and using by friends 404's. For most situations, deeper is better. The advantages of shallower rims are weight when climbing and handling in windy days. re: durability I rode on the DV46cs for a year, trainer and road. Broke a spoke (bought the wheels used and they're something like 5-6 years after production), finished the 2 hour group ride with wheel rubbing. Relaced wheel and no problems since. Tall rims are very strong, that's why they don't need a lot of spokes (otherwise the sections between the spokes would bend). In "normal" wheels, spokes become structural, i.e. a box section rim can't handle a 200 lbs load without spokes, and you can't have a few inch section of rim with no spokes, else the rim will bend in that area. But a carbon rim is typically strong enough to support such weight with no spokes. The spokes serve to place the hub, not much else. In fact, in the old Zipp rims, if you tensioned the spokes even a little more than "loose", the rim would blow apart. Keep in mind that if you crash any wheel, it may break. Consider what you can afford to replace, or what you can mentally do without. At the moment if I trashed one of my carbon rims, I wouldn't be able to replace it, but I can accept such a loss (plus I have spares, but if I had to do without the Reynolds, I'd survive). *edit* I broke a spoke 300 meters into a 2 hour ride, and did the whole ride with the wheel wobbling. It was fine, just a bit noisy. Last edited by carpediemracing; 03-18-09 at 07:11 PM. I have a wheels of various deepness. 19 (williams), 30 (beyond), 50 (beyond front) & a rear 38 (rolf rear). I think overall the 38s are good for anything, even windy days. If it's windy enough I seriously think twice about the 50 for a road race, due to a couple times I did get pushed around (I weigh ~145). Crits, I wouldn't care. You can't go wrong with either WWheelset though. I read a post a while back, can't find it now, it provided detailed evidence that in tests the optimal depth is 58mm and there is a point of diminishing returns somewhere between 58mm and disc. This is why the Zipp 404 is so popular. Also, the difference between shallow section wheels and 35mm is bigger than the difference between 35mm and 58mm, this is why the AM 420s are so popular. I am paraphrasing, so don't quote me or take this as fact. But something to look into considering the price of deep section wheels. I'd say 46 or 66, but I'm a Reynolds guy. Deep rear wheels are always usable. They only stabilize your bike, to the point that you may find it more difficult to turn. Tall front wheels, for crits anyway, you can train to use them because you probably won't exceed 45-50 mph in a crit. That's where I get nervous with a 46-58mm rim, if I'm really tight with other folks and I'm coasting. (Pedaling while moving through field is fine though). Tall wheels help in crits because they allow you to move up even when the pace is fast. So 35-38 mph is suddenly prime time for moving up because it's relatively straightforward to accelerate to, say, 40-45 mph while sitting in the field (as long as you have a clear path). Save your current shallow front wheel for super windy days, train on the deep front wheel so you can handle it in wind. If you do the latter you'll be able to use your aero front wheel on days that are pretty windy. I've done dual TriSpokes or TriSpoke/Disk on 40-50 mph wind days (50 sustained with 80 mph gusts for the former, 30 mph sustained with 50 mph gusts for the latter), and I've used aero wheels at Bethel when it's gusting up to 45-50 mph. In fact I've watched pros use dual TriSpokes on a wet, windy, stormy day that made me put on box sections wheels front and rear for my race. The pros were fine, the 4 or 5 guys on the team using them rode away from everyone else, with the exception of the current US Crit champ. However, if I were to enter a road race, I'd put on an aero rear wheel and a box section or non-aero front. I prefer having the stability up front when descending in a full tuck. What category do you race in? You can get some decent Neuvation C50 for $600, tubies weigh in at 1480grams. Myself and several teammates have these and are very satisfied, not the greatest wheels but you can't beat the price and they are solid wheels. Tho many people on BF don't care for neuvations for one reason or another. Based on what I read on this forum and the internet, I chose 58 over 38/46. Got a good deal on some Ritchey WCS 58 Tubulars. Who was probably on ~60mm deep Shurkien's? Damn what wheels do you have? When I got hit both of my aluminum wheels were toast, along with the crank, fork, and handlebars.